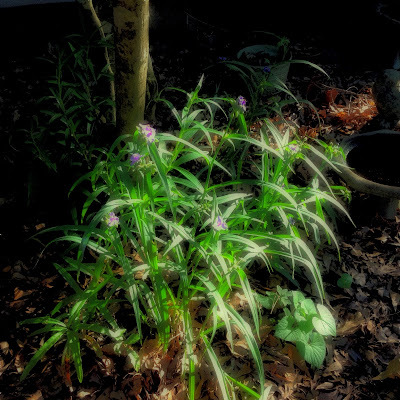 under the mountainous water oak in our front yard that stays shady ten months out of the year. Even in August when it’s hot enough to bake a quiche in the cab of my truck, it’s not bad sitting under that oak. Summers at the shore my grandparents house front porch was close enough to the neighbors to shake hands. WHen it rained we stayed on that covered porch and played board games and often talked with the neighbors. The house I was asked to leave a few years ago had a covered porch and it was the venue of many parties, plus it was where I red the paper and enjoyed a smoke...I do miss that porch. Now you've got me feeling homesick for something I never experienced! And me homesick for something we have experienced. I like the way you put memories into words. Gives me a good feeling. I'm with Jordan, 'I like it'. Back in 2003, when we and millions of others, lost their power, I noticed people on their front porch. Everyone was talking, playing games and laughing. No one could watch tv, go on the Internet or anything else since the hydro was out. This is why no one is on their front porch any more because of technology. We need to get back to this and find that relaxing way to enjoy the evenings again. I love to sit on the porch. For several summers now I've made a point of sitting out there in the evening to watch the sunset. Can we see a picture of your wonderful new bench, please? It is so relaxing to just sit on the porch in the evening. That is where I learned a lot of family stories. I actually had three rockers for my front porch for evening sitting. As I was on my way home one day I saw a car drive past me with three rockers in the trunk. They were mine! So true. We don't take the time to "sit a spell" as my grandma would say as she welcomed us on her front porch. I can remember at exactly 3pm everyday she made coffee and served my pawpaw on the front porch in her chair. And us grandkids, who were lucky enough to be there that day, were served a special treat of a soft drink in a bottle (coke, creme soda, orange, etc) while we sat on the porch with our grandparents and listened and talked with them. The best days! We have a balcony we enjoy sitting on for our morning coffee or watching the sun go down. But you're right, I don't see many people sitting on porches anymore. Many fond memories of summer nights playing in the front yard with my siblings and friends while Mom and Dad sat on the porch and soon would be joined by my Aunt and Uncle from across the street. We played till dark and they talked on long after that. Facebook has it's good points but it will never be as wonderful as a porch on a summer's night! Fun article! Wonderful article for your column, Rick. Porch sitting is to me a very rural American pastime. We hardly ever have/had people sitting on their porches here. We call them verandas and where I grew up, on a farm, the nearest neighbours were too far away to chat with from our veranda. I love sitting outside, but now with all the mosquitoes, I don't know; kind of scary.